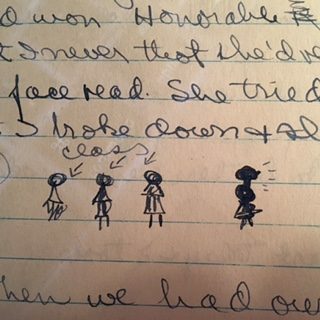 My mom, Joan, wrote every year about Memorial Day in her diaries from the 1930s and 1940s. World War I was always fresh in her mind, though it was a conflagration finished well before her birth. Here is a diary entry from when she was 17 years old, reflecting on poetry, war, the suffering of animals in zoos, and even one of my favorite medieval poets: Langland. …Well, Thursday (Thor’s Day!) I was very embarrassed. Mrs. Hellman, my English teacher, read my poem “City” aloud to class—you know, after she found out I had won Honorable Mention in Scholastic, but I never thought that she’d read it to the class! Was my face red. She tried to make me read it but I broke down and she had too. …A teacher accused me and the girl next to me of ditching a study to smoke—me! —with my face! Of course, I wasn’t though—it was all a mistake. In the midst of bawling me out, the teacher stopped and said, “You’re the girl who wrote the poetry for Scholastic, aren’t you?” How did she find out? I thought only fools read that (though that includes her!). …. Friday night Mom and I went to Lake View to see Il Trovatore—given by American Opera Company. Mom went to sleep during it and I had to hold my eyelids up! Are we cultural! Mom and I went downtown and I got me a new peasant –dusty pink – dress. I look like the “Song of the Lark” or something. It’s a dirndl and awfully cute. B.B.B.B. [Beautiful Blue-eyed Boy in Biology Class] didn’t come Saturday as I told him not to. Vera got walked out on by a boy again. She’s going to start using Lifebuoy [Soap]. …. Today—got up at 12:15. It’s Memorial Day. Read New Poetry and Modern Poetry books—Went to park to read the borrowed one in my peasant dress — laid my annual sprig of white hawthorn by the soldier in the park and whispered, “I remembered” to him. There was no new wreath for him, save mine. Sat by the pool for a while and read. There was a big St. Bernard dog near me and three fair-haired children in sailor coats—James Barrie in Kensington Gardens. Went on to zoo. The eagles look so misplaced in the ugly dark cage. What right have they to keep another living thing from the sun? And the baby lion (1½ years) who was born there. He looks like a strong man in a shop. Such a beautiful fierce young lion to never have felt the touch of Earth at his feet. Always inside. No moon, no sun, no grass. And for a young lion he is so still. He just sits and stares over our heads at things he can’t see. The other lions seem to see the jungles when they look like that, but he has nothing to see. Nothing at all…. He has a great chin as of one who has suffered and tragic golden eyes. I wish I could give him a piece of the jungle. Oh, it’s all so cruel! And here are people who have been likewise cheated…. I sort of like the serious, old sound of it—and yet not old. Langland is his name. William Langland’s Piers Plowman is actually written in Middle English. 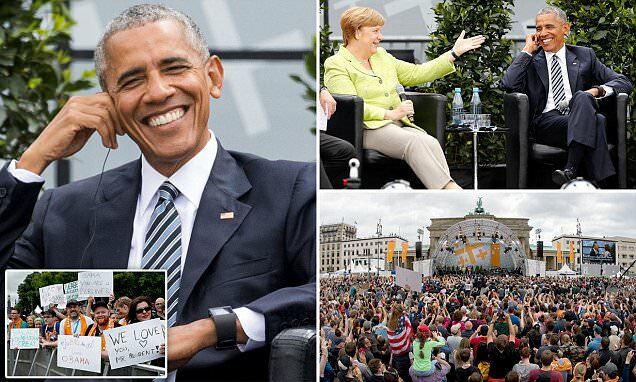 #ObamaBerlin President Obama speaking at the Brandenburg Gate reminds me of my deep love of Germany and the German language. I’m excited to go back to Berlin–where I lived 1988-90– in about a week. 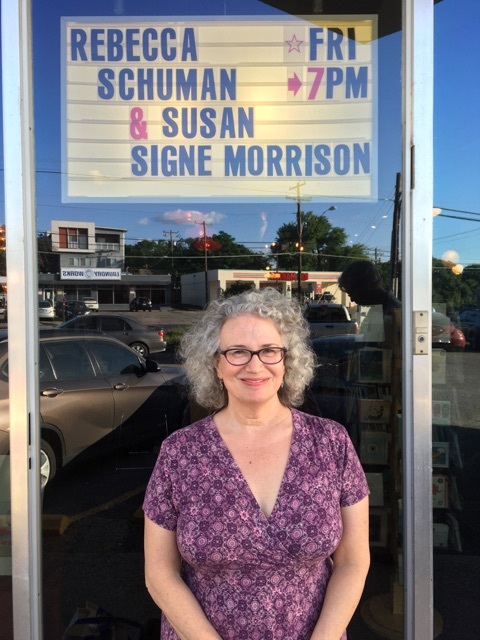 Recently I had the great delight to read again at Malvern Books, the terrific local bookstore in Austin, TX, in a German-themed evening. Here’s a video of me reading from various books. Malvern Books really curates their offerings so that every book feels handcrafted — chosen for a discerning crowd. 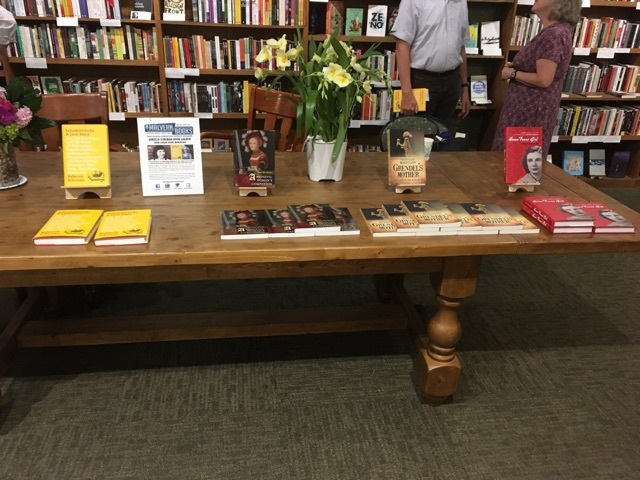 The store asked me out of the blue to help Rebecca Schuman launch her new memoir, Schadenfreude, about her experiences in Germany and with the German language. I immediately said yes. I have been laying the groundwork for writing my own memoir about my experiences teaching in East Germany in the 1980s, so this seemed serendipitous. At Malvern Books, April 14, 2017. Some of my books alongside Rebecca’s. As the warm-up act to Rebecca’s funny and engaging reading, I decided to set the stage on women and Germany. 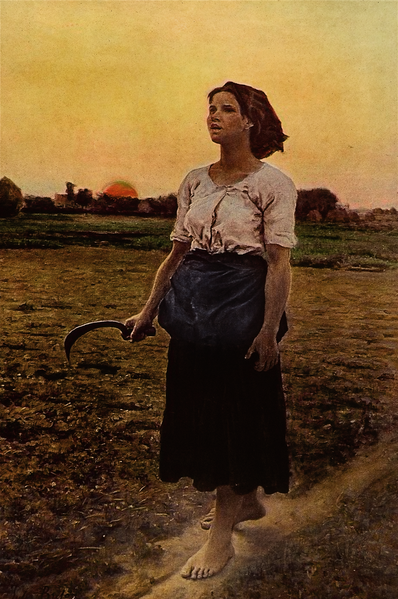 Starting with legendary Germanic women, I read two passages from my novel about Grendel’s Mother. Then I turned to historic German women and read from my book, A Medieval Woman’s Companion: Women’s Lives in the European Middle Ages, recently translated into German. I shared highlights from the lives of the first known woman dramatist, Hrotsvit von Gandersheim, and that of the medieval superstar, Hildegard von Bingen. Rapidly moving through history, I shared two more books. The last, to prepare for Rebecca’s material set in the mid 1990s, came from a piece in my book on The Literature of Waste. Here I reflect on how my experiences in the former GDR make it impossible for me to choose in superstores with too much choice. I still cannot go into Costco. I also shared scenes from Home Front Girl, focusing on just a few of the many moments where my mother Joan ponders Germany and the German language. 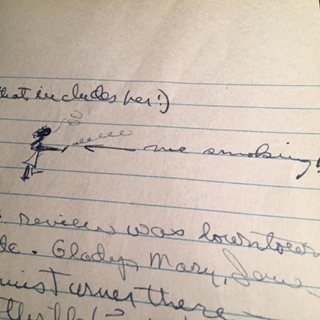 These feature some of my favorite bits in her diary. Here are a couple of them, ranging from the lyrical to the sarcastic.
. . . Well, world news goeth on too . . . see this—“Allies (Britain and France) give in to Germany—leave Czechoslovakia flat!” Czechoslovakia says she’ll fight and Germany says it will be a “real” War. I wonder what Hitler said to Chamberlain that made Britain side step so neatly. 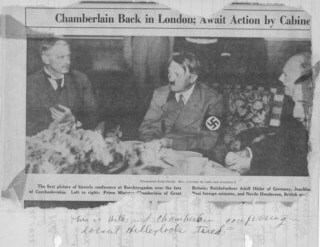 [Joan pasted into her diary this newspaper clipping depicting Chamberlain and Hitler at the famous appeasement talks about Czechoslovakia.
. . . Went to German Christmas party last night—Santa Claus, a pretty tree, . . . marzipan that I like, etc. Betty came too. . . . They sang German Christmas carols, “O Tannenbaum.” . . . We joked about it sounding like a Bund meeting and Betty wanted to get up and shout, “We’re all Americans!” But we mustn’t even pretend to have that kind of patriotism. God, keep us wise and cool. . . .
Then they sang—a male quartet—old songs in the faintly meaningful language (I can understand about one quarter) . . . and I leaned back dreamily. . . . I like to hear their strong male voices—deep and proud—singing the good songs. Schubert—“Silent Night” . . . the tree brings out the Nordic, the Scandinavian, in me and I think of my ancestors. Betty whispers, “What an ugly language it is!” The world’s spinning outside, the moon is gleaming on the white snow. . . . In here we are separate . . . warm—out of the world. Someone opens a window and a chilly blast sweeps in. . . .
Herr Jolles sees me and nods, smiling. . . . He makes an announcement and it is only afterwards I learn he has said the punch is spilled. My German is none too good. But the almond paste cookies are. I eat a great many. Christmas Day, 1939. 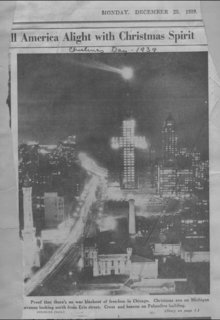 Chicago downtown, a year before Joan’s entry cited here. I passed suddenly the Cunard window. . . . An exhibit for the BWR—pictures of little children in Britain—homes bombed—helmets that could be knitted for the RAF—a noble purpose—but it’s making war in our hearts. . . . The little German children are bombed and hungry too. . . . And all the sudden, in an emotional intensity, I thought, “This may be the last Christmas we shall have” . . . I should be wise and know the world will never end. . . . An unofficial truce played over Christmas in Europe today—Hitler said, “German fliers will not fly on Christmas if British flyers will not.” And they did not. . . . And so a white, bloodless Christmas there and the sky is weeping here. . . .
Flunked my German test—F. . . . That’s bad, you know. Hitler would be disappointed. He’d better put off the invasion for a while. . . .
And here is Rebecca Schuman reading at Malvern Books. What a fun evening!